In the past few months I've gotten a bunch of requests from friends on what to see with teens in San Francisco. I've been doling out a lot of advice. My travel blogging group also has some members requesting advice (for different age groups), and so I'm compiling a list of their blog links about visits to our great city. Two days in San Francisco by Travel with Bender - seeing the highlights in a short amount of time - with great photos! Kristine Dworkin, Trekaroo's Northern California Guroo recommends West Bluff Beach in the Presidio (especially in warmer months like September). Kids can make sandcastles in view of the Golden Gate Bridge, also with great views of Alcatraz. If you walk across the Golden Gate Bridge, she likes the souvenirs at the Round House near the toll plaza. "They'll put hard hats and orange vests on your group, then shoot them against a green screen and have you select a background that makes you look like a work crew high in the bridge towers." Trolley line too long? Go to the Cable Car Museum instead. Want to take it easy? Head to Golden Gate Park says Debbie Dubrow of Delicious Baby. There's a lot to do outdoors and indoors, with good restaurants close by. Wandering Educators recommends five places to go, not all of which are on the typical tourist track. While hotels abound, several of the family travel bloggers recommend booking an airbnb place. You'll be renting from actual Bay Area owners, not hotels, and accommodations are often more spacious than hotels, with a neighborhood feel. Check out some Bay Area factory tours - many of which are free and (almost) all are child-friendly. Personally, I like to do ice cream (self-guided) tours - here's a list of great ice cream places in San Francisco. 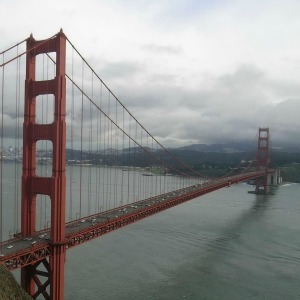 Be a tourist in San Francisco with kids - whether or not you're local! Lots of ideas and links. Red and White Fleet's Golden Gate Bay Cruise - Tickets are $14 (half off) for this hour-long narrated boat ride.